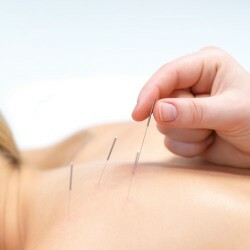 Myofascial dry needling is a technique that uses a needle, similar to those used in acupuncture, which is applied to the muscular system to deactivate myofascial trigger points. A myofascial trigger point is a hyperirritable point in a muscle that is associated with palpable nodules in tight bands of muscle fibers. These points may produce local tenderness, referred pain or a local twitch response. The needles are inserted into the trigger points to deactivating them. This in turn will decrease the associated referred pain, causing pain relief, healing, and also stimulating the production of endorphins. You should not confuse dry needling with acupuncture as they are two different things. Myofascial dry needling uses points that are based on western anatomy and physiology while acupuncture uses points that lie along meridians in the body or their energy channels. It is most commonly used for conditions such as back pain, fibromyalgia, headaches, tendonitis, as well as acute or chronic trigger point pain. Myofascial dry needling can help to establish a painless range of movement during the treatment, facilitate muscle relaxation and provide pain relief. No. Chiropractors are primary healthcare practitioners; therefore a referral is not necessary. More and more GP’s are however referring to Chiropractors via the Enhanced Primary Care Program (EPC).